In 1976, with the succes of Alive! opening up new vistas for the band and the Gibson sponsorship still alive and kicking Paul still bought his guitars from time to time. "I vaguely remember buying the white Gibson Explorer at Manny's on 48th Street. […] I put on all chrome hardware, black knobs, and one of those rhythm/treble rings from a Les Paul around the toggle switch." (Guitars that Rule the World in Metal Edge presents KISS Alive 1996) The Gibson Explorer had been part of the impossibly "futuristic" batch of new designs in 1958 along with the Flying V (and the Moderne which didn't see commercial release until 1982) and, like its "sibling", it wasn't a success by any definition, perhaps as much due to the decision to omit it from the Gibson catalog until 1980 as its radical design, and it was quietly discontinued in 1963. It was reintroduced in 1976, still comfortably outside the Gibson catalog, and the white Explorer Paul bought was brand new. Stock it featured a mahogany body and neck with a rosewood fretboard and all gold hardware (an ABR-1 bridge/tailpiece, the so-called Gibson Pat. No humbuckers, and Kluson Double Line tuners). The Explorer first turns up during the rehearsals in Reading in November and as we can see it looks as if the pickups have also been replaced with Paul's favored DiMarzio. "DiMarzio custom-winds pickups for me; I like them very much. I don't go for super distortion. [...] My DiMarzios are like patent-applied-fors, but a little hotter." (Guitar Player 1978) The replecement bridge is just another ABR-1 but this one chrome and the rhythm/treble ring Paul mentions is clearly visible. This is the guitar used for two of the songs on Don Kirschner's Rock Concert which were taped during the Winter Tour rehearsals (but not aired until May the following year). Thankfully Paul brought the Explorer with him for the band's first trip to Japan in March and April of 1977 and the picture here shows the Schaller Harmonica bridge more clearly. Although not the case in the picture the Explorer had started to take on its role as the "reliever" of sorts at this time. For the videotaped show from the Budokan on April 2 he uses it for Makin' love which requires a capo at the first fret (the way Paul plays it, Ace plays un-capo'd). 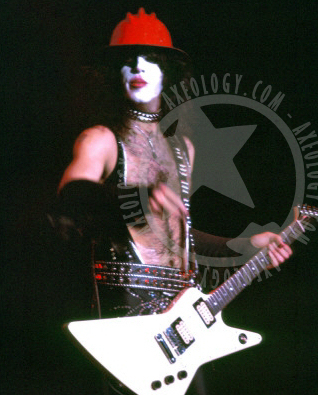 Check the video footage on KISSology at around the 21-min mark to see the capo. For the Love gun tour, also known as the Can-Am Tour, over the summer of 1977 the Explorer had settled comfortably into its new role. By this time there were two songs in the setlist which required a capo, Makin' love remained while the band added Hooligan, and by the looks of it the Explorer handle both those duties (until it was temporarily replaced in that role by a Gibson Doubleneck for part of the tour). The picture on the left is from opening night in Halifax and it shows the Explorer with a capo at the 7th fret for Hooligan. There exists a pic from the same night that shows the Explorer capo'd at the first fret but it is shot from the side and in the interest of clarity I've chosen the pic below which is about as clear as it can get as regards the identity of the guitar and the placement of the capo. [Right] The Schaller-equipped Explorer during Firehouse, a rather unusual occurance in 1977 when it mostly assumed "capo duty". [Right] The 1976 Explorer capo'd at the 1st fret for Makin' love. [Left] The 1976 Explorer capo'd at the 7th fret for Hooligan on opening night of the Can-Am Tour. The guitar that traveled with the museum setup for the Convention tour and was auctioned off at Butterfields is not this one; that Explorer is from the mid-90's, Bruce used it from time to time in 1992, and still has its original gold hardware. 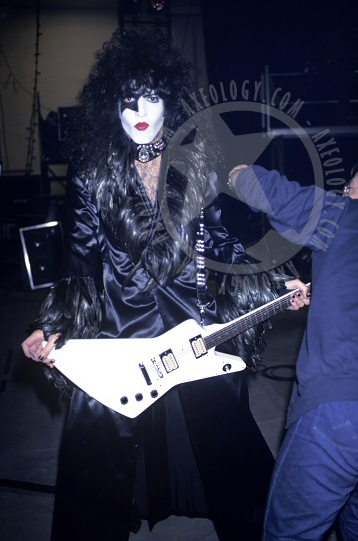 For reasons unknown, there have been talk about Paul's general dissatisfaction with Ibanez from various sources, Paul strayed from his signature PS10 during the Return of KISS tour in 1979. The "cracked mirror" PS10 was still his no. 1 but a few non-PS10 guitars worked their way into the backup slot. 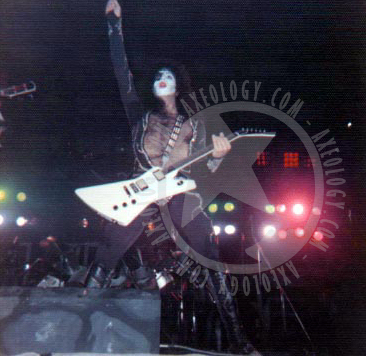 The guitar shown here first shows up in Wilwaukee, WI on September 24 and looks like nothing ever seen on a KISS stage. The body shape is obviously Explorer-like but it has a mirror overlay that covers the entire guitar and the identity of the brand is undiscernible. 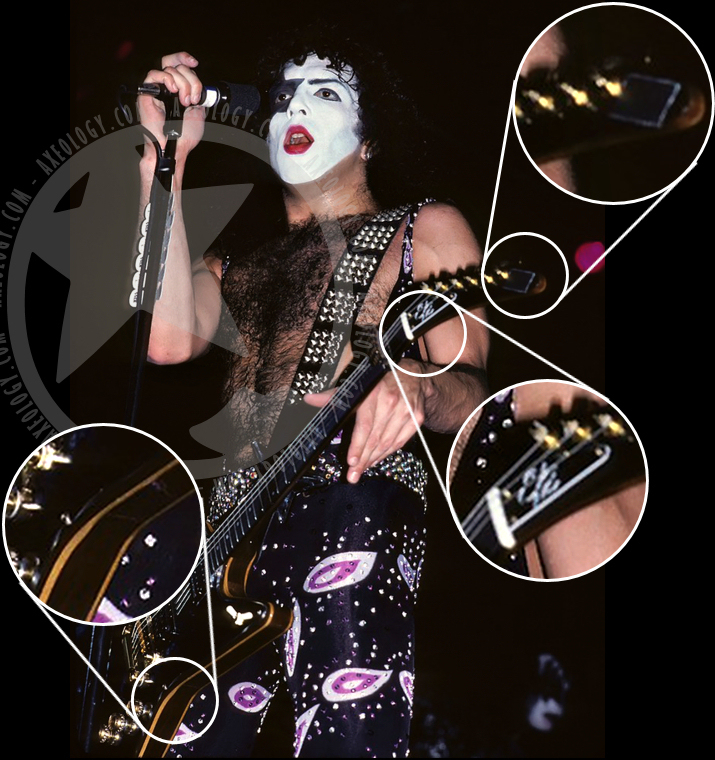 When I was taking my first steps into identifying and researching the guitars of KISS many years ago there was a grand total of two pictures available of this guitar and based on Paul's use of custom Hamer Standards at the time I assumed that this was also a Hamer, albeit slightly different and more "Standard-like" than his other Hamers (see the Hamer section). This wasn't an entirely baseless assumption after Vintage Guitar ran its 4-part The History of Hamer in 2000. Part 1 in the June issue had a list of artists who had purchased Hamers, thought to be from either '79 or '80, which had Paul as the recipient of 3 Hamer Standards. Nevertheless, it turns out I was about as wrong as one can be. The picture below is a great high-res one that shows several details about the guitar that were previously unknown and based on that the deduction is fairly simple: this is a 1979 Gibson Explorer II. The Explorer II was, along with the Flying V II, an attempt to "update" the concept and generate new sales. The re-introduced Explorer from 1976 (see above) still hadn't made it into the Gibson catalog but by 1980 the Explorer II had found its way in. So, what makes this a Gibson Explorer II rather than some other guitar? The three zoomed details below tells the whole story. The taped-over logo on the headstock. This excludes the Hamer Standard quite easily since the smallest Hamer logo on the Standard covered the space below the E and B-string tuning posts and was oriented in line with the tuning posts. This piece of tape is distinctly angled, a lot smaller, and after the E-string tuning post. The trussrod cover which features a stylized version of the guitar's moniker: E/2. The body under that mirror overlay. The Gibson Explorer II had a slightly odd 5-ply body of walnut and maple with the choice of which wood was the "top". Paul's version here is a walnut top. So, it's a Gibson. That only leaves one question: why tape over the logo on the headstock? The initial thought might be that it was a way to sidestep any contractual obligations to Ibanez but considering the almost blatant use of Hamers for the latter part of the Return of KISS tour that seems unlikely. Why bother covering up the fact that he played a Gibson while his Hamers were plain to see? My guess, and it is just a guess, is that Paul might have been talking with Hamer about a possible endorsement or sponsorship. Paul was into Hamers anyway, and he stated it quite explicitly in some interviews at the time, and they were trying to revive the spirit of the original Gibson build quality. Everyone into guitars at the time probably knew about Paul's involvement with Ibanez on the PS10 so in a sense that was a given, but having started playing custom Hamer Standards it might look a little "bad" if Paul had turned around and played a Gibson. That is, if he was looking for an endorsement deal. Otherwise, why bother? Two minor details about this guitar. 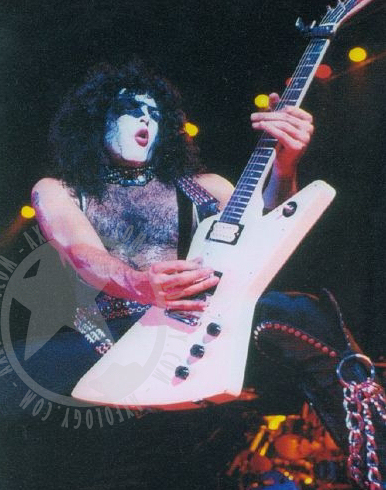 First, Paul had the strap button moved to the back of the heel on this guitar much as he had on the Firebird I, and this despite Gibson lauding its new ultra-safe "Posi-Lok" strap button. (Strangely enough the 1976 Explorer didn't get this modification. Instead it just got a screw-in loop.) Second, the catalog version had a more elaborate tailpiece, the TP-6, which allowed for fine tuning while Paul's guitar has a more standard Tune-o-matic tailpiece. Judging by vintage guitar sales of this model it seems as if at least some guitars left the factory with this bridge/tailpiece configuration, perhaps early in the production run. Of course, changing the tailpiece is a very simple modification, especially if you're removing all the hardware to fit a mirror overlay anyway. 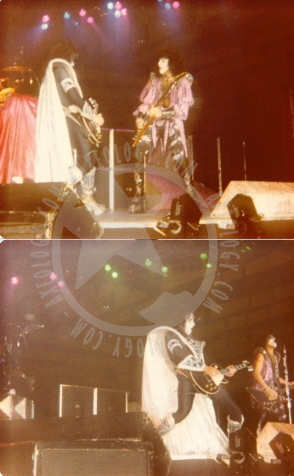 The Explorer II only lasted until the end of the 1979 tour, the miniscule pictures on the right show the guitar at the last show of the tour in Toledo, and according to a 1980 interview in Sounds magazine he claimed he hadn't been particularly impressed with the guitar. After the end of the tour the 1979 Explorer II joins the ever-growing ranks of guitars that passed through Paul's hands and then vanished into the mists. 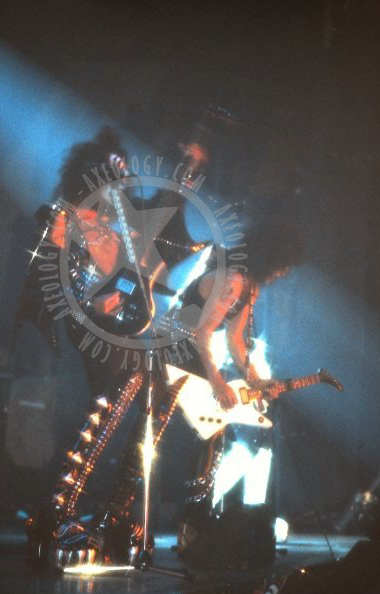 [Above] Last stop for the 1979 Gibson Explorer II and the Return of KISS tour.